In the 80 years leading up to 1904, Lowell, Massachusetts had grown from a sparsely populated corner of East Chelmsford into a bustling manufacturing city of 95,000 residents. Like any Edwardian-era city, Lowell faced its share of fire risks, especially in its downtown area. Before January was even half over in 1904, Lowell had suffered three substantial fires, one of which claimed the O’Donnell & Gilbride Department Store, the city’s largest. To tell the story of the origin of the O’Donnell & Gilbride Department Store is to also tell the story of what is great about Lowell, Massachusetts, and other mill cities like it. Patrick Gilbride, an Ulsterman from what is today Northern Ireland, immigrated to the United States in 1874 at the age of 20, settled in Lowell, and soon found work with J. V. Keyes & Company, a dry goods firm. He learned the business, saved his money, and by 1880, at the age of 26, opened his own dry goods store with a fellow Ulsterman, Constantine O’Donnell. 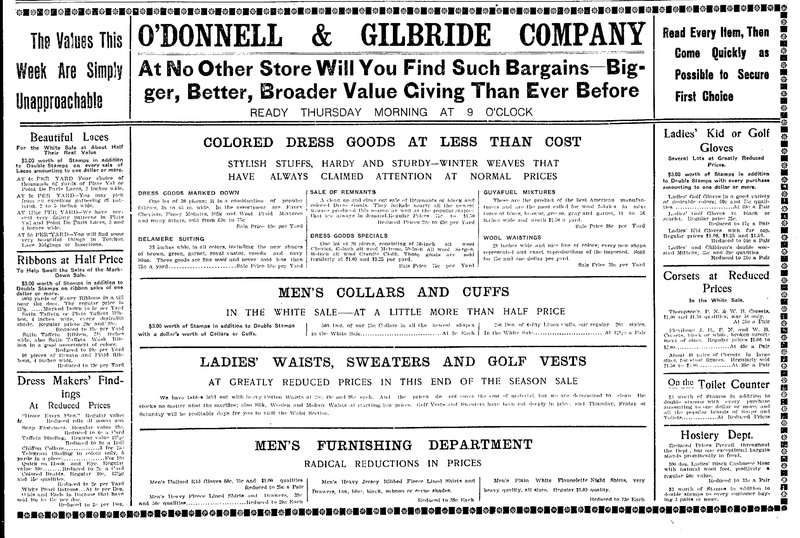 The O’Donnell & Gilbride Department Store was born, on downtown Lowell’s Merrimack Street. Through a combination of a strong work ethic, good business sense, and some luck, the two men built O’Donnell & Gilbrides into the city’s largest department store. By 1904, the store had expanded from the original location in Merrimack Street’s Albion Block into a second Merrimack Street Block – the Bascom – and also into Middle Street’s Fellows Block. Bridges had been constructed to span the narrow alley that separated the Merrimack Street and Middle Street areas of the store. 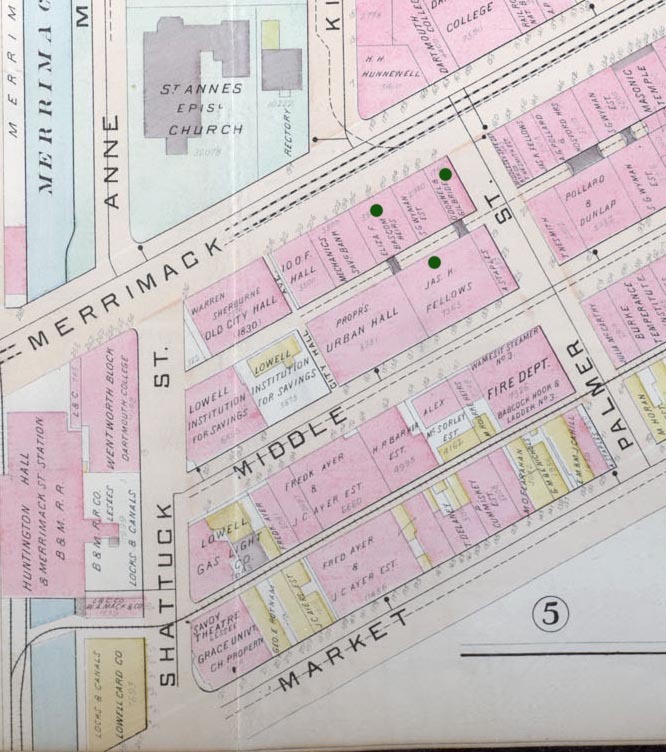 The Buildings marked with black dots represent those occupied by O'Donnell & Gilbride in 1904. The bridges connecting the buildings are represented by the black lines spanning the alley between the buildings. Just past 9 o’clock on a Tuesday night on January 12, 1904, John Quinn, the night watchman for O’Donnell & Gilbride, had just rung in his watch clock in the men’s clothing department on the first floor of the Merrimack Street store, when he began his walk to the carpet department in the adjoining Fellows Block. He approached the bridge connecting the buildings, opened the door, and was pushed backward by an inferno that had completely enveloped the carpets beyond. By the time he reached the street, the bells were already sounding. William R. Kennedy had activated the alarm. Kennedy had gotten off work at the nearby Lowell Electric Light Company moments before and was waiting across the street on the Middle Street side of the Central Fire Station for a friend to get off work. He was alone, the firemen were below in the basement, which happened to have a bowling alley. He looked through the window at the wintry desolation at Middle Street’s intersection with Palmer. Below, his friend was among the other firemen bowling. He had planned to descend into the basement, find his friend, and perhaps bowl a string or two in another moment or so. Suddenly, he heard shouts from the direction of the Reynolds Brothers restaurant in the Staples Building across Palmer Street. Fire! Even through the closed windows, he could clearly make out that the man was shouting about a fire. Outside, above the shouting man, Kennedy quickly found the flames – silhouetting the top of the Fellows Block directly opposite the Central Fire Station. The firemen were somewhere below, still bowling. Kennedy thought of the maze that was the Central Fire Station, and dashed outside into the cold. At the corner of the building, he broke the glass of the Signal Box, inserted the key into its lock, and pulled the alarm. Inside the Central Fire Station behind him, the bells began to toll. It was the third fire in Lowell within the last five days. 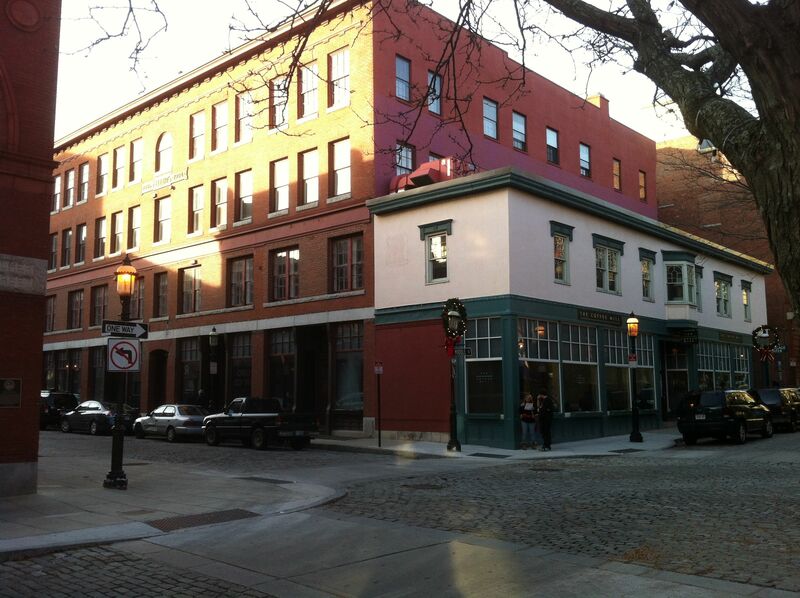 The Rebuilt Fellows Block on Lowell's Middle Street (brick). A small marker between the third and fourth story windows memorializes the 1904 Fire. The smaller Staples Block (with the white second story) today houses the Coffee Mill Emporium. Behind both is the Albion Block, which fronts Merrimack Street. At about the same time, Joseph H. Gormley walked along Merrimack Street, and was passing O’Donnell & Gilbride’s when he heard cries from within the building. He stood outside for a moment, uncertain whether to get involved. He then distinguished cries of “fire!”, dashed into the Albion Block, and tore up its stairwell toward the source of the cries. In the corridor, he found first a woman screaming and running to and fro. He looked past her toward the window overlooking the alley between Merrimack Street and Middle Street – and saw flames glowing inside the Fellows Block. He set to knocking on each of the corridor’s doors to arouse the residents. They, and many others in downtown Lowell on that night spilled into the streets to watch the fire. The tolling of the alarm bells filled the streets of downtown Lowell, as the firemen assembled at the intersection of Middle and Palmer Streets outside the Central Fire Station (in front of the brick building in the photo, at left). The alarm sounded, and just moments later, a loud explosion, and then a second, roared through the night sky. People as far away as Lawrence, Haverhill, and Nashua reported seeing the flames above Lowell that night. A brisk breeze buffeted the crowds gathering in the street. Sparks showered down upon them. The flames whipped from the upper story windows of the Fellows Block. Long, roaring tongues of fire bridged overhead across Middle Street. The flames were blowing against the Central Fire Station itself, its third story wooden window frames were beginning to smolder. The station’s weathervane representing a streamer, atop the tower, was melting. Without the Central Fire Station, the fire would rage unchecked throughout the entire downtown area, causing millions of dollars in damage. The firemen diverted their attentions from the Fellows Block to their own station. Ten streams of water gradually brought the flames to smoldering tendrils of smoke. The station was saved, but behind them, the fire continued to rage through the Fellows Block. The wall facing Middle Street groaned and appeared to waver, though whether it was actually wavering or if this was an effect of the flickering firelight was debated among the firemen. The firemen eventually conquered the flames threatening the Central Fire Station and turned seven streams of water back toward the Fellows Block, now fully engulfed in flames. The firemen held their ground on Middle Street, but with one final groan, the Middle Street wall wavered and fell into the street. An avalanche of smoldering stone and brick poured over several of the firemen. The crowd gasped; several women wept. Ten firemen sustained injuries in the collapse. As Assistant Chief James F. Norton was pulled from the rubble with a broken leg, the capstone from the Fellows Block, four feet square and weighing more than two tons, was hurled against the wall of the Central Fire Station cracking its wall from floor to ceiling, and narrowly missed several bystanders. The winds shifted again and threatened the Pollard Building. Glass shattered from its windows, and hit the street below. The building’s walls grew hot. The firemen diverted the water to the Pollard Building. Steam hissed from its bricks as the water hit the walls. At this point, with flames filling the night sky over downtown Lowell, managers at the Thompson Hardware Company, at the nearby corner of Shattuck and Merrimack streets, nervously watched the growing fire as it neared their building. The managers thought that the great heat from the flames would ignite the powder and dynamite they had on hand, causing a great explosion. They loaded the dynamite and powder on a wagon and carted it away. Instantly, the streets cleared as the crowds dispersed to check on St. Anne’s on Merrimack Street, even then a historical landmark on the Lowell landscape, dating to the early 1820’s when it was built as a place of worship for Lowell’s mill girls. As the crowds rushed to check on St. Anne’s on Merrimack Street, the firemen’s toughest battle continued upon the bridge connecting the Fellows Block with the Albion Block – pictured, as it appears today, at left, and, as it appeared in 1904, below. At this point, the firemen were losing hope that the Fellows Block could be saved. From their vantage point atop the bridge, they watched as the flames issued from the windows of the Fellows Block and raged across the narrow alley. 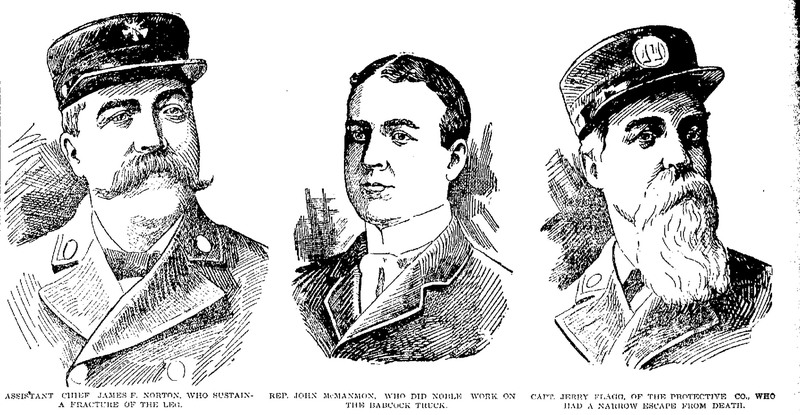 Six firemen fought the flames from atop the bridge. Several more fought the flames from the several stories of fire escapes above the bridge. Flames shot below, around, and above them. They worked their way up from the bridge, battling one step to the next, as they calmed the flames until they no longer spanned the alley, threatening the Albion Block on Merrimack Street. Below, more firemen stood, throwing a stream of water at the men on the bridge so that their clothes would not catch fire. Another stream was aimed at the bridge to keep the flames from destroying the bridge and the fire escape stairs above it. 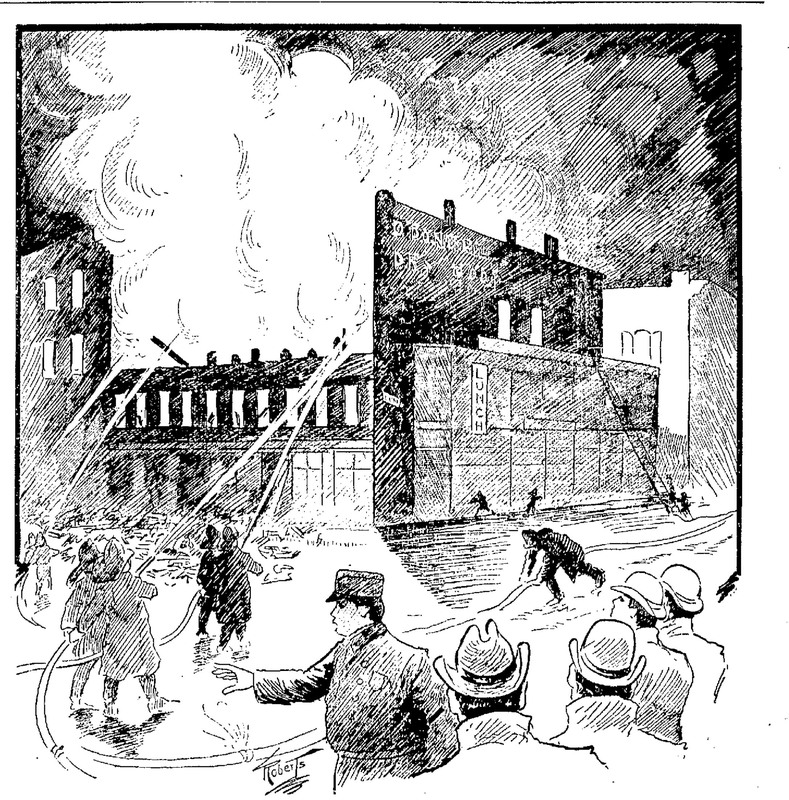 Once the bridge was secured, the firemen took a length of hose to the top of the fire escape, turned it to fight the flames raging within the department store, and then realized that the hose had turned dry. The firemen and then the many spectators who heard them began to cry “water!” “water!” loudly, but it was ten suspenseful minutes before the water issued again from the empty hose. A cheer went up and the firemen set to fight the flames again. As the firemen fought the flames issuing from the Fellows Block, the fire continued to threaten O’Donnell & Gilbride’s main store on Merrimack Street. The edge of the roof of the Albion block caught first, the sidewall began smoking next, and then the spectators watched in horror as a thin line of flames advanced toward Merrimack Street. The fire fighters gave up on saving the Fellows Block, and set their efforts on saving the Merrimack Street buildings. It was after midnight before the fire was under control, but it wasn’t until one o’clock in the morning when the firemen began packing up their equipment and leaving the scene. In the aftermath, the Fellows Block suffered the heaviest losses and was considered a total loss. The Block was pulled down ten days later, and subsequently rebuilt. The Staples Block too suffered heavy damage, but was rebuilt and still stands today. 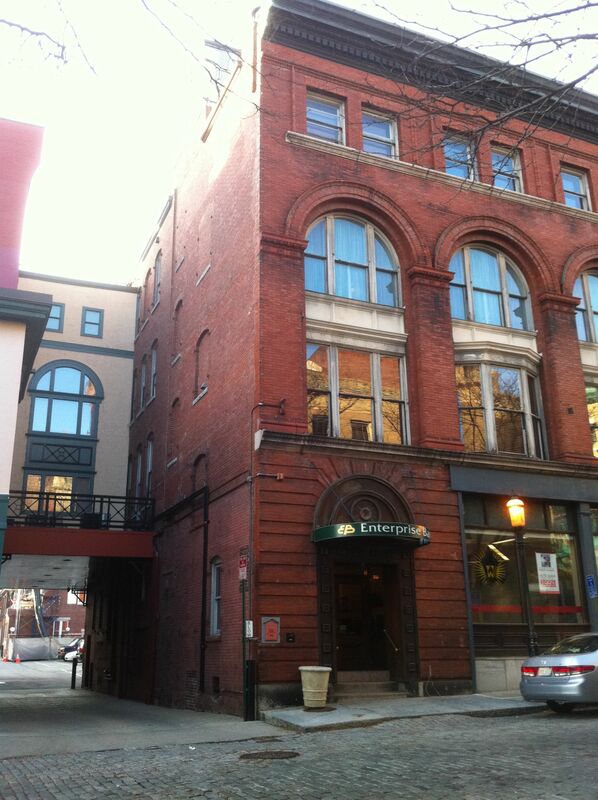 The Albion Block, which currently stands on Merrimack Street, and the Bascom Block, its Merrimack Street neighbor which is no longer extant, were considered near total losses. The Urban Hall building, which stood on Middle Street at the present-day site of the parking lot next to the Fellows Block, also suffered heavy damage. The Central Fire House, due to the valiant efforts of the firemen, suffered only minor damage. The O’Donnell & Gilbride Department Store did not re-open after the fire. The partners took the fire as a chance to amicably dissolve their partnership after nearly 25 years in business together. Constantine O’Donnell and Patrick Gilbride each eventually reopened separate businesses. Patrick Gilbride re-opened a store at the Merrimack Street location where he had opened O’Donnell & Gilbride’s with Constantine O’Donnell over two decades before. He died more than ten years later, in March 1914, mourned by those who knew him as a quiet, unassuming man who became an inspiring business leader in the early downtown Lowell community. Wow, Ryan, this was some account! Since getting into genealogy/family history, historical events such as this seem so much more REAL. What a fantastic piece of Lowell’s history, very well told, thank you. Thanks for the comments, Karen and Bob. 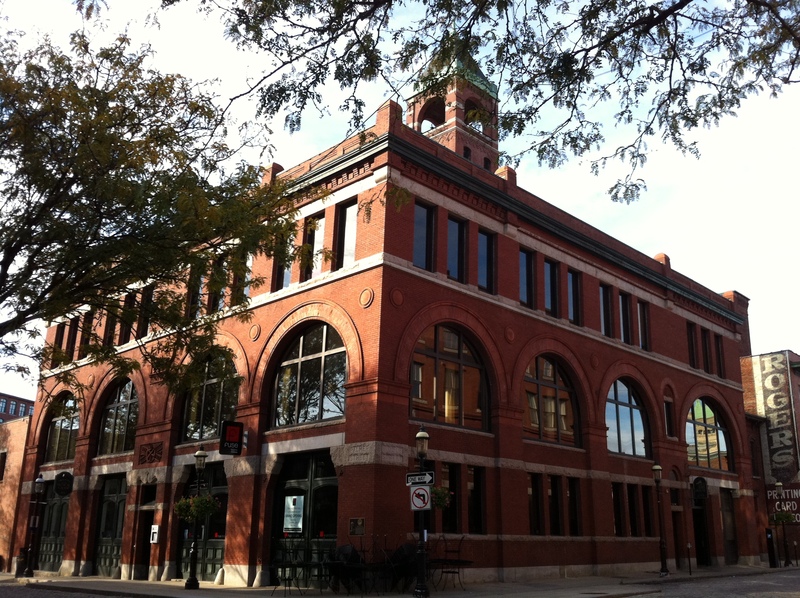 I enjoyed writing the post – Downtown Lowell has some great history. You sure have a lot more detail than I could squeeze into my account of this tragedy. There are such amazing stories in our past that help us make our today what it is. Thanks Patricia – I enjoyed writing this post. I have an ancestor who was a member of the fire department; it’s been great learning more about what his life was like.